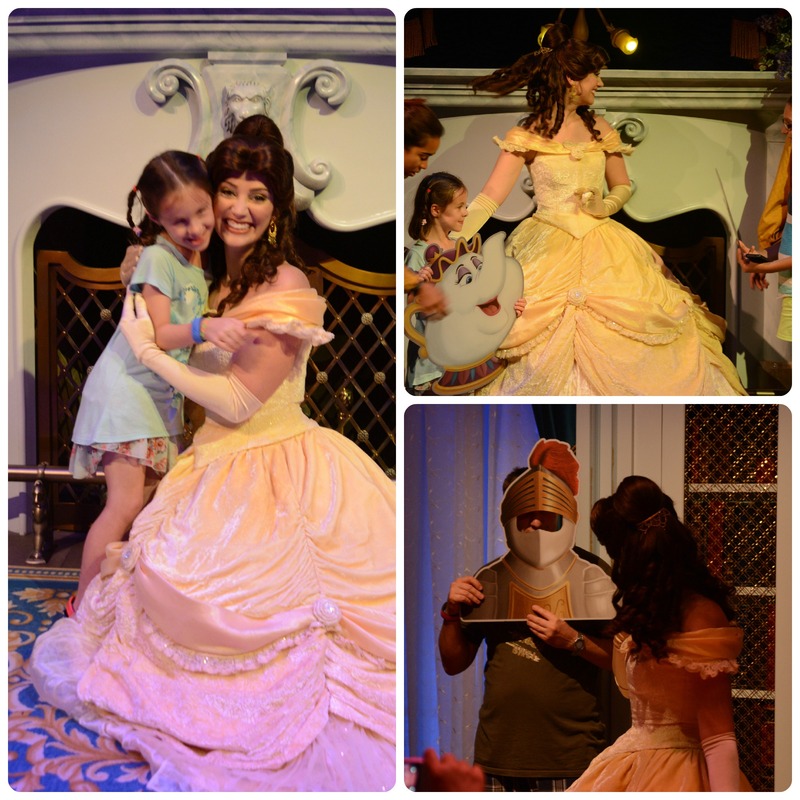 During our first visit to Magic Kingdom, we had booked evening Fast passes to The Enchanted Tales With Belle. I really wasn’t sure whether this was a ride or an attraction, but both girls told me they wanted to see this so we booked a fast pass as the internet consensus told me there was an average wait of 45-60 minutes. 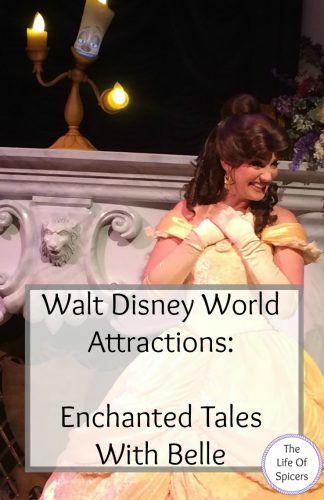 Our fast passes were for the evening, but as it was late afternoon when we were thinking of leaving the park and we were in the vicinity of Enchanted Tales With Belle, we decided to risk the 40 minute wait time instead of having to travel back in the evening when we were getting tired. Surprisingly our wait went past quickly, but I was still no more clued up as to what we were going to face when we got inside. The queue was interactive when we stepped inside Maurice’s cottage. Along with a welcome blast of air conditioning, we stepped into Belle’s living room where she grew up and got to look at all the pictures on the wall, and the furniture that was dotted around. I wish I had taken more photos of this part now. Next time! We were ushered through via a cast member a few at a time into a holding room where we met Madame Wardrobe. When everyone is gathered, two cast members appeared to assist Madame Wardrobe as she introduced herself and explained a little bit about what was going to happen. The essence of the attraction is an interactive storybook featuring Belle and any guests that wish to join in. The remainder become the audience to watch the show. The audience are hand picked at this point to play a part in the upcoming proceedings, but anyone who wishes to have a part can which I think is great for all the children who desperately want to get picked at events like these and don’t due to the limited numbers. 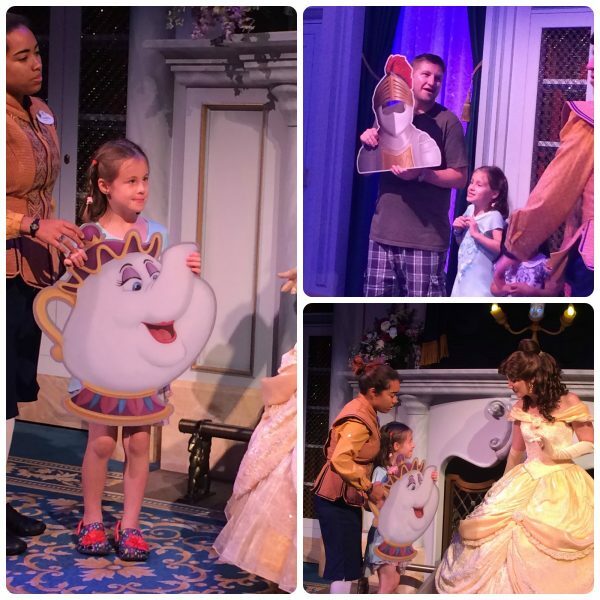 Miss A was lucky enough to be chosen to play the part of Mrs Potts, and Hubby was a knight. 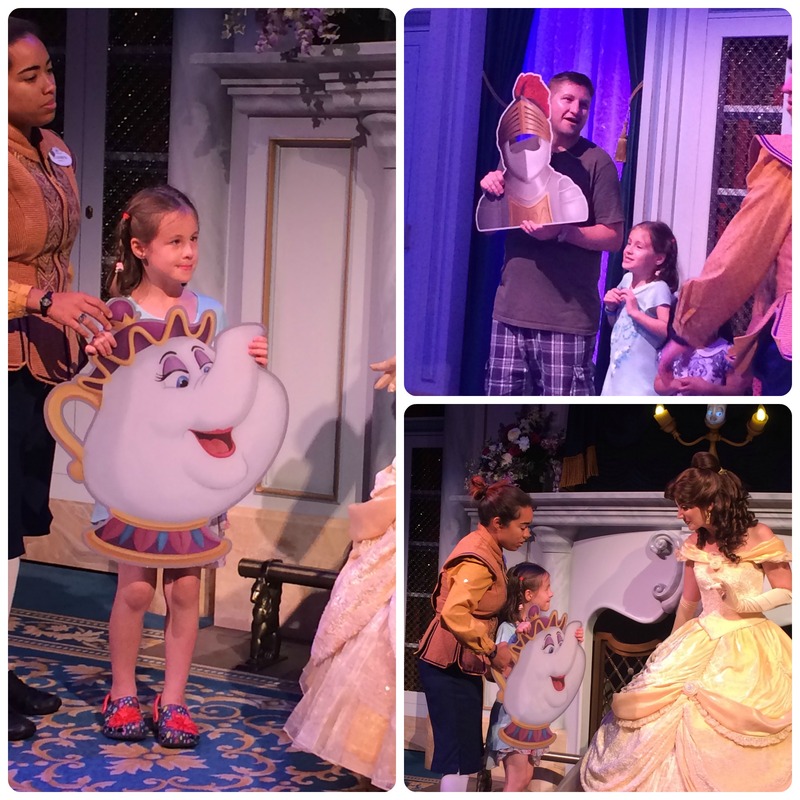 In front of us the magic mirror parted and led us through into another room where we met Lumiere who tells us that we are going to surprise Belle as she comes into the room. The audience sits on benches in rows, and I was lucky enough to be on the end of the row which was ideal for taking pictures. You are asked not to stand during the show, but you can take as many pictures as you like. With two of my family playing parts, I was eager to get as many pictures as I could. 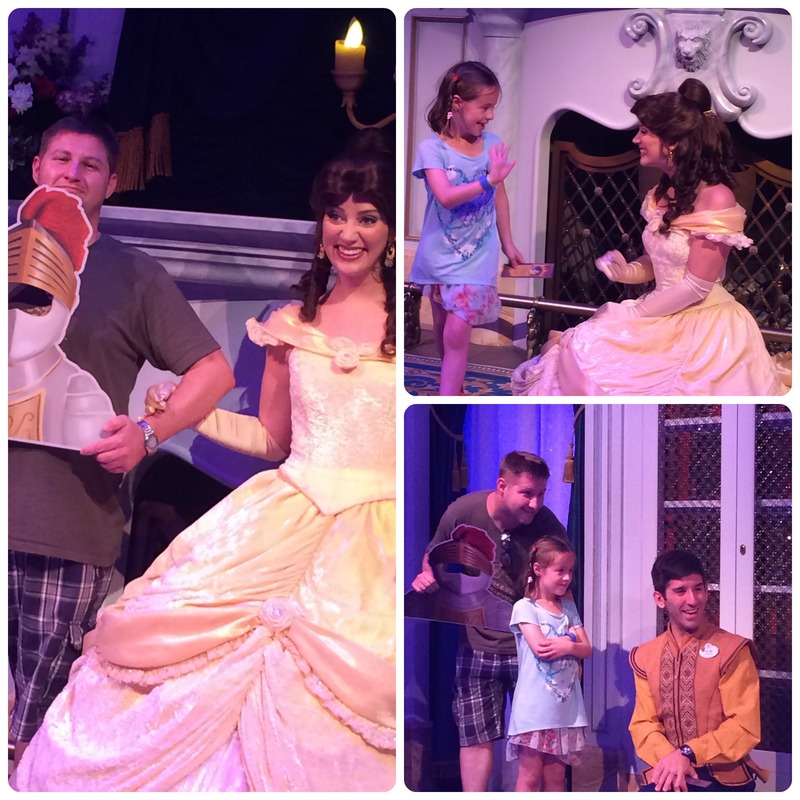 The whole show takes around 25 minutes, and it’s great entertainment for all ages. I am a huge Beauty and The Beast fan so this was great for me. I was a little sad at not being able to meet the Beast during this attraction, but he only appears for dinner at his castle. Belle was amazing with all the children and made sure she met with each one for a few seconds to pose for a photo and hand out a souvenir bookmark. You really can’t visit Magic Kingdom without a trip to this attraction. Fast Pass it if you have one spare, but if not the queue is mostly in the shade and seems to pass quickly. On our second visit to Walt Disney World in 2016, we also queued for approximately 40 minutes for this popular attraction. This time, Miss A was picked to be Maurice which she thoroughly enjoyed. A fast pass would work great for you then for this attraction.